Congratulations to all of our authors! Endorsement on back cover by Tabish Khair. “We live in a world where battles are fought in cyberspace, relationships are forged through voice-over-IP, and declarations of love are made through speedy text messages. Pertinently then, the stories in Only Connect weigh the deep impact of technology on our lives, relationships, and the ways in which we perceive each other and ourselves. While Meenakshi Bharat’s ‘B Wid U Soon’ shows how, despite the distance between them, technology helps a couple share the birth of their baby, Janhavi Acharekar’s ‘Sneha, 25’ highlights the hoax of digital ties as a young girl is conned by a cyber-lover. The sinister face of technology is alarmingly demonstrated by Malik Sajad’s graphic tale, ‘Facebooked’, Chandani Lokugé’s ‘Trial by Media’, and Kiran Nagarkar’s ‘The Race for Arms’. Technology changes the language we speak, as dramatized in Neelum Saran Gour’s ‘A Software Sonata’. It colours our perception of lived experience, as shown by Sharon Rundle in ‘Fugue for Guinea Pigs’. And, in fact, technology even irrevocably changes the way we connect with art as Yasmine Gooneratne describes in ‘Barry Meets His Muse’. 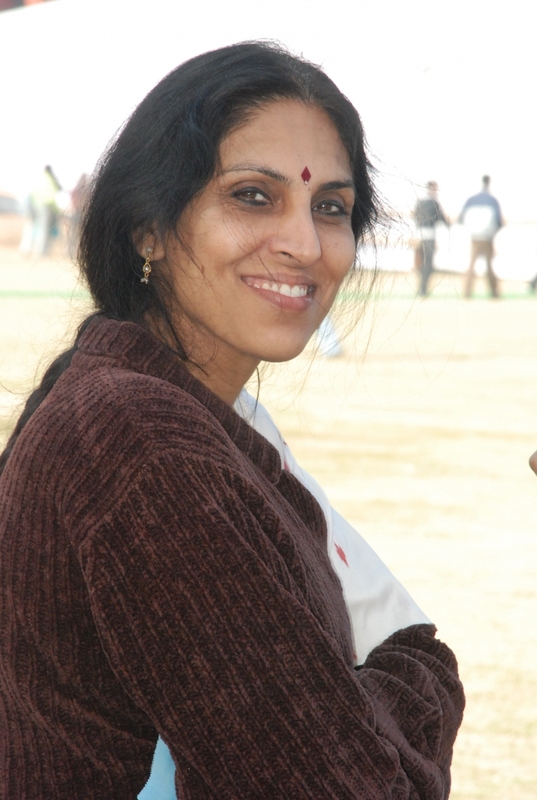 Meenakshi Bharat, University of Delhi, is a writer, translator, reviewer and critic. Some of her published books are: The Ultimate Colony: The Child in Postcolonial Fiction; Rushdie the Novelist; and two volumes of Indo-Australian short fiction entitled Fear Factor: Terror Incognito and Alien Shores: Tales of Refugees and Asylum Seekers. Sharon Rundle is Chair of the University of Technology Sydney Writers’ Alumni; has served on the Board of Directors of the NSW Writers’ Centre; and is a founding member of Asia Pacific Writers and Translators. She coedited Alien Shores and Fear Factor. 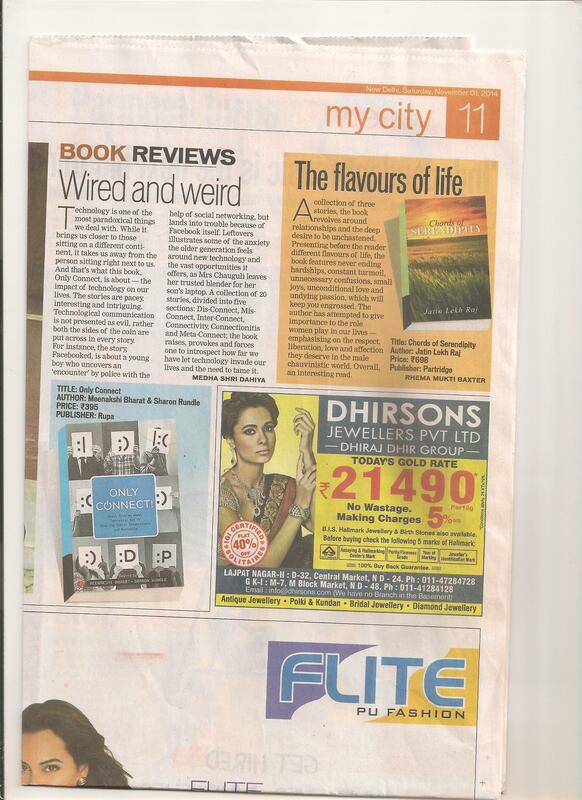 Sydney Launch of “Only Connect!” was covered by Paul McKenzie at the Indian Telegraph, May 2014, Page 36. Alien Shores launch with slide show. has just been released and is in book shops now! 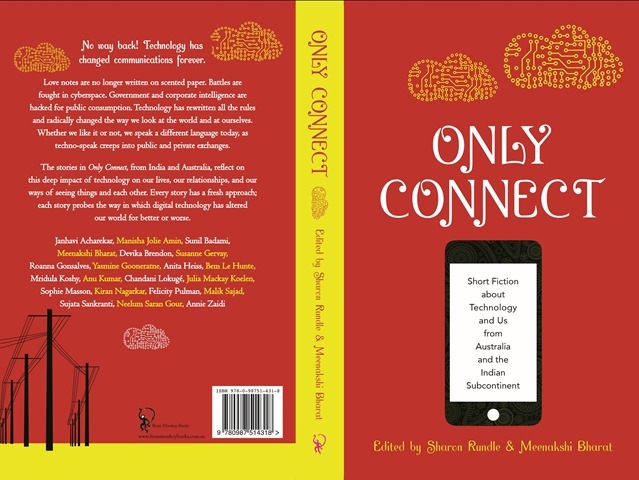 Thank you to all our authors from Australia and the Indian subcontinent who have contributed to this exciting volume of stories that include crime, mystery, murder, deceit, missed connections, relationships, romance and humour. Truly a wide range of responses to our theme of ‘technology and us’. Published by Brass Monkey Books and available from book shops including Dymocks Melbourne, Readings, Dymocks Erina Fair Central Coast, UTS Co op Bookshop and Lesley McKay Woollahra (who provided books for the launch), among others. Kerry Goldsworthy reviews Only Connect in the Sydney Morning Herald, Spectrum Books, In Short Fiction page. 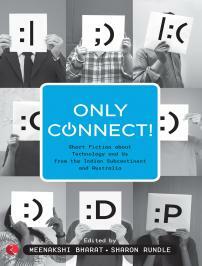 Salma Shah reviews Only Connect in Indian Link, June 2014. It was lovely to see so many of our authors at the launch. Thanks to Felicity Pulman, Julia Mackay-Koelen, Bem Le Hunte, Manisha Jolie Amin, Devika Brendon, Susanne Gervay, Roanna Gonsalves and our publisher Kabita Dhara at Brass Monkey Books for joining us in celebrating the release of our book of stories. Many thanks to our authors from the Subcontinent who sent best wishes and promises to be at the launch in spirit if not in body. 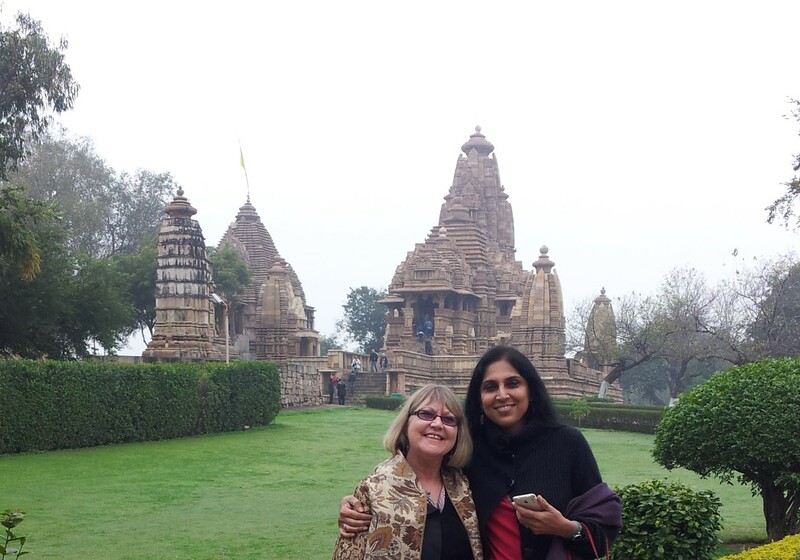 My sincere and heartfelt thanks to Co-Editor, Meenakshi Bharat, who is the better half of our editing partnership and who longed to be with us in person but this time it was not to be. Meenakshi now has all the photos and a sound recording from the launch. 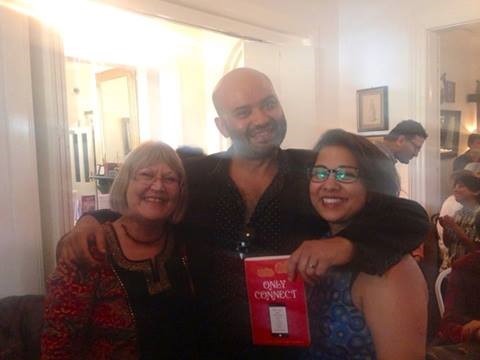 Sunil Badami, author and ABC radio presenter, bon vivant, raconteur, flaneur, did us the great honour of launching the book with a rousing and humorous speech that had us all spellbound. Sunil generously read from the stories of our contributing authors as he spoke about the significance of Only Connect. Sunil’s story ‘Leftovers’ is one of the highlights of the volume. While it may be unusual for one of the contributing authors to launch the book, we really could think of no-one better than Sunil. After enjoying Sunil’s speech and toasting to the success of Only Connect: short fiction about Technology and Us, we continued to party and celebrate its release. I know I had a marvellous time chatting to the authors, publisher and guests. My heartfelt thanks to all at the Hughenden Hotel for sponsoring the launch and thanks especially to Jamie and to Ryan Power who gave so generously of their time to set it all up; and to Deidre Stein who designed the poster, invitations and champagne vouchers for our launch. All the Hughenden staff went out of their way to take care of guests who attended the launch and those who stayed at the hotel for the weekend. We all noticed and appreciated it. And last but not least thanks to Vincent’s Bar and Restaurant for providing the champagne and for welcoming our guests who booked for lunch. 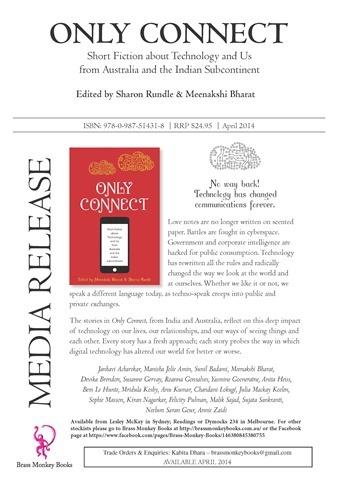 SBS Hindi Kumud Merani interviews Meenakshi Bharat and Sharon Rundle about Only Connect: Short Fiction about Technology and Us. An International and Regional Programme featuring: Fear Factor Terror Incognito Indo-Australian Authors’ Anthology Panel, chaired by Sharon Rundle, with excerpts of short stories from a unique Indo–Australian collaboration, edited by Sharon Rundle and Meenakshi Bharat, which includes David Malouf, Salman Rushdie, Kiran Nagarkar, Tabish Khair, Neelum Saran Gour, Janhavi Acharekar, Temsula Ao, Thomas Keneally Andrew Y M Kwong, Rosie Scott, Meera Kant, Sujata Sankranti, Guy Scotton, Jaspreet Singh, Denise Leith, Gulzar, and Yasmine Gooneratne. Readings will be followed by an in-depth discussion, by authors Susanne Gervay, Devika Brendon, Jeremy Fisher and Meenakshi Bharat from Delhi of the issues raised. Book signings will follow the panel discussion and questions. Also on the Programme: Titi Amaral and Jude Conway’s audio visual narrative of East Timor Women’s brave stories of resistance and survival from the anthology Step by Step, this is Supported by East Timor Women Australia and an Exhibition and sales of East Timor textiles in the Resident Artist’s Gallery; and Ouyang Yu, The English Class, Roger Averill, Keeping Faith, Jane Carswell Under the Huang Jia Tree: Two Journeys in China through story and memoir, transit lounge us across cultures of China, New Zealand and Papua New Guinea. Books and CDs will be available for sale and signing. A 10% discount for purchase of 5 books or more. Reading the books beforehand will ensure a lively and informed discussion during Q and A. The Meeting Pool at Montsalvat offers the World Matters audience a very special menu to sustain you through the two days. 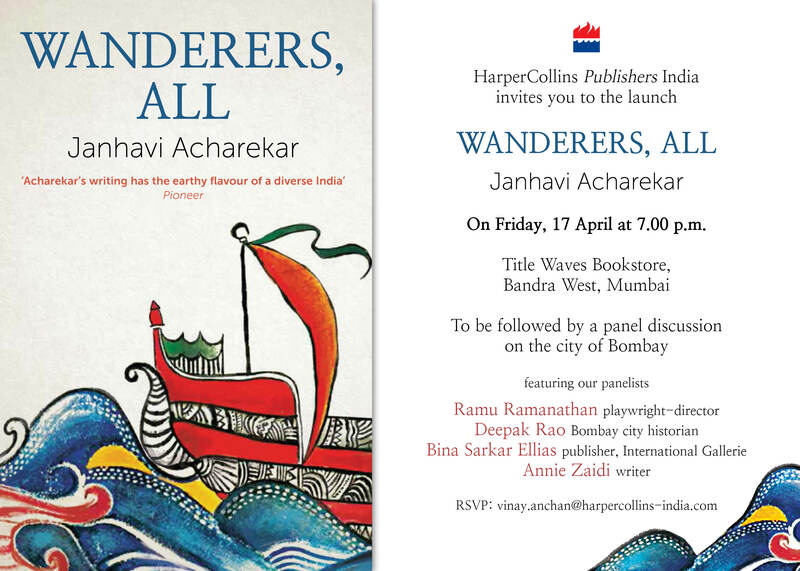 Join us for an exciting and stimulating weekend of literary brilliance! Book now for the World Matters Festival, details on the websites and programme. I hope you have enjoyed the holiday season and your celebrations whether Yuletide and Solstice; Christmas and Boxing Day; Hanukkah; Ashura or combinations of the different seasonal events. We have even had the gift of rain that has washed and replenished this parched land. Listening to the sound of rain on the roof was bliss. My Christmas and Boxing Day were peaceful and shared with friends and family, some through the magic of technology. We were fortunate enough to enjoy lovely food and thoughtful gifts. It was low-key due to the many demands on time and energy throughout the year but relaxed and cheerful. Thanks to all who sent cards, e-cards, calendars, letters and gifts which are all very much appreciated. 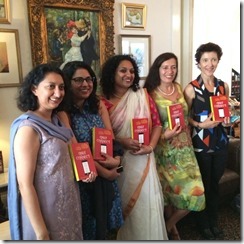 Addressing the dread of living with unpredictable peril, constant fear and terrorism, Oxford Bookstore and Picador India hosted last week the launch of the book ‘Fear Factor: Terror Incognito’, a cross-cultural anthology of stories by Indian and Australian authors. The book was launched by Joginder Paul, renowned Urdu writer. It was followed by a panel discussion on escalating terrorism all over the world, in which poet and academician Sukrita Paul Kumar and renowned theatre personality Renu Chopra participated, among others. The book is edited by Meenakshi Bharat, professor of Venkateshwara College and author of many literary works. “It is an attempt to ward off fear and restore humanity by reminding the readers about mankind, unity, peace and harmony. It motivates them to uphold humanitarian values and light the fire of anti-terrorism, thereby making the planet safe for the entire human race,” Meenakshi Bharat said. 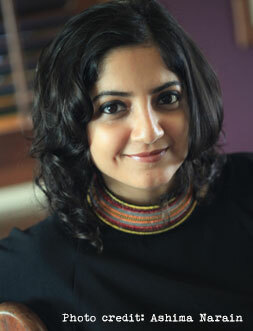 The articles have been contributed by famous authors from Australia and the Indian subcontinent, including David Malouf, Salman Rushdie, Neelum Saran Gour, Tom Keneally, Rosie Scott, Jeremy Fisher, Susanne Gervay, Tabish Khair, Denise Leith, Andrew YM Kwong, Devika Brendon, Gulzar, Meera Kant, Guy Scotton, Sujata Sankranti, Kiran Nargarkar, Temsula Ao, Jaspreet Singh and Janhavi Acharekar; with a foreword by Yasmine Gooneratne. They do not offer solutions; instead they lead readers along hidden paths to make their own discoveries. 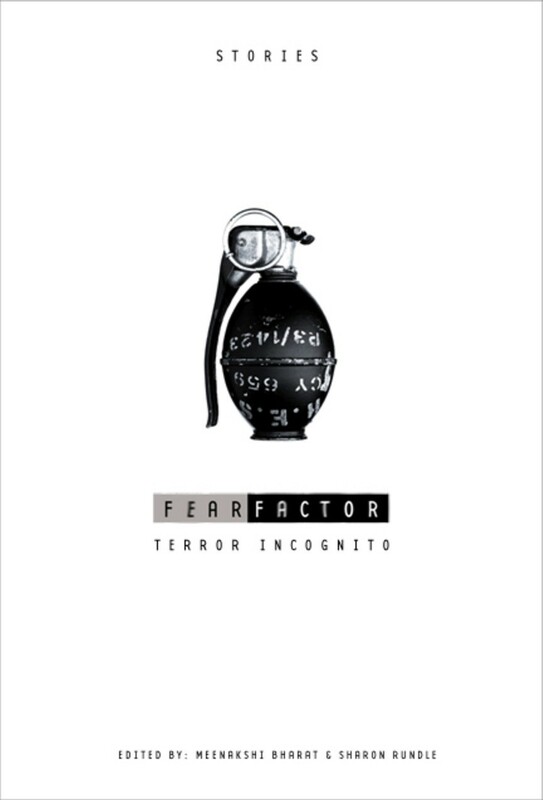 Fear Factor: Terror Incognito (Picador, Rs 295) edited by Meenakshi Bharat and Sharon Rundle brings together stories from two different lands to explore the theme of terrorism. This anthology of short stories also serves another latent purpose. It is a collaborative effort to understand whether the artist responds to these violent times any differently than the layman. The answer, the editors argue, is in the affirmative. An artist — whether an author, a painter or poet, located in India or abroad — often attempts to examine the complex factors that have led men and women to inflict terrible retributions on society. Fear Factor includes contributions by Salman Rushdie (“For Kashmir, for Paradise” taken from Shalimar the Clown), Kiran Nagarkar (“In search of Essar” from God’s Little Soldier) as well as a kitschy story by Gulzar in which a Muslim man, hounded by the fear of death in riot-torn Mumbai, ends up killing a fellow Muslim on a local train. Whisper Words by Neha Tara Mehta in New Delhi India mentions "Fear Factor Terror Incognito". Sujata’s short story ‘’An Eye for an Eye’’ [published in ‘Fear Factor Terror Incognito’] is an excerpt from her forthcoming novel ‘’In the Shadow of Legends’’. Regarding the theme of her novel, Sujata said that an act of terror did not end with the act. Its consequences go beyond the act. She said that her story [in the anthology] was about the consequences of terrorism. She also read out from her work and said that she was happy to present the story … Sujata had won first prize for her story ‘’The Wrap and the Weft’’ (sic) in the Commonwealth Short Story Competition in 1998. Event Details : Oxford Bookstore, New Delhi in association with Picador India is hosting the launch of ‘Fear Factor: Terror Incognito’, a collection of stories to instil humanity, wisdom and ward off fear, written by famous writers like Gulzar, Salman Rushdie, Thomas Keneally to name a few. 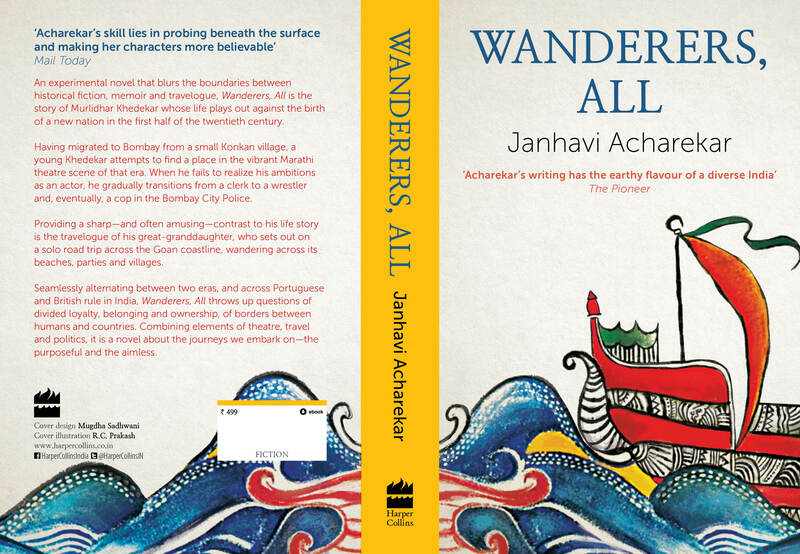 Edited by Meenakshi Bharat, Professor of Venkateshwara College, New Delhi and Sharon Rundle, author, the book will be release by eminent Urdu writer Joginder Paul, followed by a panel discussion with famous poet and academician Sukrita Paul Kumar and renowned theatre personality Renu Chopra. About the book: ‘Fear Factor: Terror Incognito’ is a collection of stories meant as a call for humanity and sanity in response to the fear mongering that goes on today. And, actually, it’s a very firmly light and cheeky collection with a great perspective and sense of humour. Now that the tension and excitement leading up to the festivities is over and we have a brief respite before ringing in the New Year, it’s time to reflect and draft a piece of writing to work on through the year. Then you’ll have a story, poem, play or article ready to submit by next September for the 2010 Festive Season.